I have appropriated it as my own. My Dubai. This blog is about Dubai. About its vibrancy, its energy, its opportunities and its offerings. 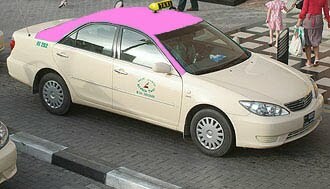 From the glitzy neighborhood of Burj Khalifa, to the urban Sheikh Zayed Road, to the golf greens of the Creek Club or the Emirates Club, from the authentic Oud Metha to the suburban UmSuqeim, to the royal Zabeel, to the popular Satwa, my pink taxi drives. All the while, I observe, I marvel, I notice, I feel the pulse of my city. This week, from Christmas eve to New Year's day, Dubai has slowed down, gradually, almost unnoticed, but I have measured the slower pace, from the volume of traffic at any given time and also from its accompanying vibe. Dubai is usually spinning at a speed I fear to handle after the "breather" week we have experienced over the Western holidays. I loved the UAE National day festivities, because it also heralded a time of respite, albeit a very jubilant one. During our two Eids, we also enjoy a fabulous tranquility. This slow-down doesn't resemble the depressing Sunday shut downs in Swiss cities, nor does it have equivalent with the rather somber atmosphere of Thanksgiving or Christmas day in the United States when ALL activities cease. In Dubai, activity never stops: even on slow-down, cars swirl around clover shaped interchanges, malls overflow, airplanes land at the wee times of the night, supermarkets are open 24/7, golf courses are lit till 10pm, and concerts and events attract party goers. This New Year is just an example. 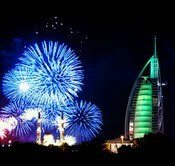 Splendid fireworks burst in multiple venues, showcasing our landmarks. The metro which habitually closes early had extra trains transporting partygoers at 3 am in the morning. 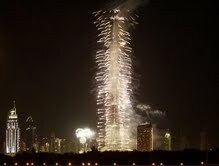 My brother's Zabeel/DIFC neighborhood was squatted by revelers celebrating loud. And I will be sure to feel it. "This is My City",said the ugly expat in the famous movie City of Light.In her context,the Pink Taxi blogger says it with love and appreciation to what the Pearl of the Gulf has given us all in tranquility,refuge and respectable life. May the example for all Arab cities remain an oasis of hard work,hard play and serene life in 2012. PTB forgot to give a shout out to Jumeirah where she grew up. Jumeirah has always been the jewel of Dubai, "its hot coal," and upperclass neighbourhood. She also forgot to mention Deira and Shindagha where Dubai came to life. What about Khawaneej, Bur Dubai, Mirdif, Marina, JBR? I guess there are too many "Dubais" to describe in one entry. One just needs to take an extended drive around the city to discover new neighbourhoods.